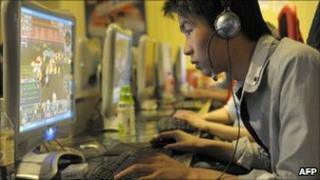 China has set up a new government body to control information on the internet. The new set-up will enable the government to keep a tighter grip on the content available to Chinese internet-users inside the country. Beijing operates vast internet censorship, dubbed the "great firewall of China". Websites deemed sensitive by the government are routinely blocked. The Chinese government has put a lot of resources into controlling and censoring the internet content available to its citizens. Until now, the responsibility fell to the country's Information Office and quite a few other agencies across various government ministries. There was often in-fighting as each tried to wield power over what was allowed on the internet, from online games to politically sensitive content. The newly-created State Internet Information Office brings technical and political control over the internet under one body, with Information Minister Wang Chen in charge. This in effect gives his ministry more power than the other agencies involved. This indicates that online news and information, new media business and internet access will most likely come under tighter control, as the government clamps down on dissent following the Jasmine Revolution in the Middle East and north Africa. At the same time, the government hopes to use the internet to promote itself both at home and abroad.